Want to be a winner for a great cause? Computer Weekly is once again teaming up with leading overseas development charity CARE International to announce the launch of the first CARE IT Adventure Challenge fundraising event, exclusively for IT professionals and those working in the IT industry. The event follows on from the successful partnership between CARE and Computer Weekly for the annual CARE IT Three Peaks Challenge which has raised tens of thousands of pounds over the past three years - with last year's winners from Barclays pictured above. 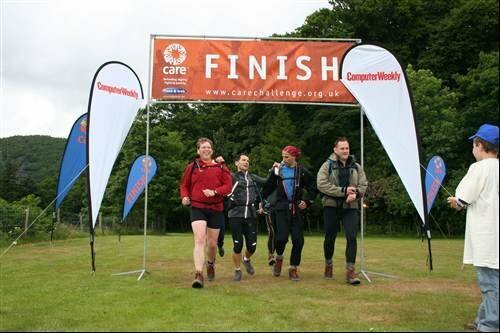 Computer Weekly is once again teaming up with leading overseas development charity CARE International to announce the launch of the first CARE IT Adventure Challenge fundraising event, exclusively for IT professionals and those working in the IT industry. CARE works in over 70 countries helping 59 million of the world's poorest people find a route out of poverty through long-term development and emergency aid. Many of CARE's overseas projects make use of IT in the most extraordinary ways, including using Google Earth to plan the construction of refugee camps following natural disasters or conflict; use of blogging from war zones; providing PCs and IT training for mothers to help them run schools for their daughters in areas where girls are marginalised. If you work in any sector of the IT industry and are interested in taking part in the CARE IT Adventure Challenge, visit www.carechallenge.org.uk/IT or call the CARE Challenge Team on 020 7934 9470.